Travelers might not expect a snow-covered mountain in Arizona, but Humphreys Peak at 12,633 feet in the San Francisco Peaks is the highest of the state’s 27 summits exceeding 10,000 feet in elevation. The San Francisco Peaks are the remains of an ancient eroded stratovolcano north of Flagstaff. This range is sacred to Native American tribes in the area. The Navajo call Humphreys Peak “Doko’oosliid” or “Abalone Shell Mountain,” and the peak is their Sacred Mountain of the West that marks the border of their territory. The peak is also sacred to the Hopi, who associate it with the cardinal direction of southwest. In winter, the mountains are a prime skiing destination at the Arizona Snowbowl. The Humphreys Peak Trail starts at the base of the ski lifts. The trail is avalanche-prone in winter and very windy in spring, so summer is the preferred climbing season. There may even be snow on the trail as late as June, and monsoon storms, with lightning, may strike the Flagstaff area from July to September. The hike on this trail is 4.8 miles to the peak of this sacred mountain. 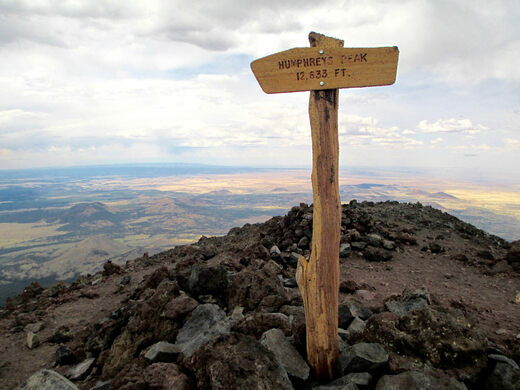 From the Arizona Snow Bowl at the end of the ski lifts, take the Humphreys Peak Trail for 4.8 miles to the summit. The wreckage of a deadly bomber plane crash can still be found near an Arizona peak.